Dharma Cycle 1 – The Mahabharata World! In school, when we learned the Bhagvada Geeta and were asked to write essays (nibandha) on it, the first word in every essay, first word of Geeta was Dharma. Dhritrashtra’s first question? What did my sons do? But, he prefaces it with battle field as not Yuddha kshetra but DHARMA Kshetra. The Yuddha is about the Dharma. Yuddha itself is Dharma. Krishna then goes to teach Geeta for 18 chapters about Dharma. Dharma is often taken to mean “religion” or “duty.” But these meanings are incomplete. In the Geeta, Krishna refers to Dharma in progressively deeper ways, shedding light on the meaning of the term and its importance for personal spiritual growth. Dharma is the cosmic onion, with its ability to surprise us deep in its “lairs” no pun intended, dharma binds us and questions us and tasks us and examines us, and advises us. Like we peel the layers of onions, it tears our eyes and it surrenders flavors for us to enjoy. Dharma brings with its achar-an literally tears and gratification of our senses. As the Gita’s first chapter unfolds, Arjuna also grows wary of the influence of dharma. He fears that his, and Krishna’s, participation in the war will lead to a violation of dharma and perpetual residence in hell. In the name of dharma, Arjuna argues for nonviolence by assuming that to attack and kill so many leading men, nearly all of whom are fathers and husbands, will destabilize the important families and communities for which these men are responsible. The families themselves are vital to the peace and virtue of society. Arjuna has sounded a familiar theme from many Vedic books, namely that dharma protects when it is protected, but injures when it is injured. Arjuna would be killing kings in the battlefield, virtually all of whom protected at least the basic rules of dharma in regard to ethics, social order, and traditional, worldly religious rites. That is exactly what Krishna would say over next eighteen chapters, albeit more gracefully and sophistically. That dead habit dharma of duty that bound and kept the tongues of Bheeshma and Drona silent could not restrain the voice of Vikarna and the answer the perpetrator Karna gave was You are too inexperienced and as per Dharma you should keep quiet in front of elders. Same Karna who would shout down Vidura, Bheeshma, Drona and Kripa’s counsels later used the seniority Dharma to keep Vikarna quiet. When they burned the house to murder Kunti and the orphans, they cared not a whit for dharma, when they poisoned and drowned a child, they cared not a whit for dharma. When a young man stood to stop the crime, the brutal assault on the woman, Karna stopped the one coming to succor citing Dharma! When his head was in the line of Arjuna’s arrow, Karna asked for protection of Dharma, because it was convenient for him to take shelter of Dharma at that point, same dharma he kicked all the way to that Dharma-kshetra, that pit he had dug himself which caught his life’s wheel. It is significant here that only after a thorough explanation of the eternal soul, the Lord mentions Dharma as an additional point to consider. From any other scriptures we may take away the truth, the impression that life is meant to practice Dharma. When this life is full of uncertainty there is no time which is unfavorable for living the life as per the ‘dharma’. Think as if death is within it’s reach to you and obey the ‘dharma’. Death can come anytime so always do good things aka Don’t wait for any favorable time (‘muhurta’) at which you will start living good life! For the growth of praja thus have these percepts of morality been declared. That which is connected with inoffensiveness is religion. Dharma protects and preserves the people however it may do so. So it is the conclusions of scholars that WHAT MAINTAINS ETERNAL is DHARMA. That is what is contradicted by the vibrant everchanging Dharma, Krishna will describe. BUT THIS IS WHERE this war time conversation, this Shrimada Bhagvada Geeta is so crucial, so amazing!! Bhagvada Geeta tells us that Dharma itself is meant to assist the real goal of life: understanding the eternal soul and its relationship with the Supreme Soul, may it be Krishna or someone even higher. Living life as per Dharma’s precepts is not enough. Krishna concludes this brief reference to Dharma as one’s personal duty by saying, “Now if you do not execute this battle, then having given up your personal dharma and reputation, you shall incur sin” Sloka 33, chapter 2. Arjuna started chapter one contending if Krishna and he were to fight the Battle and killing the kings opposing them, they would be destroying dharma and incurring sin. Now Krishna tells Arjuna that the truth is just the contrary. By not fighting, Arjuna would be rejecting dharma—in fact, his personal dharma—and thus incurring sin. 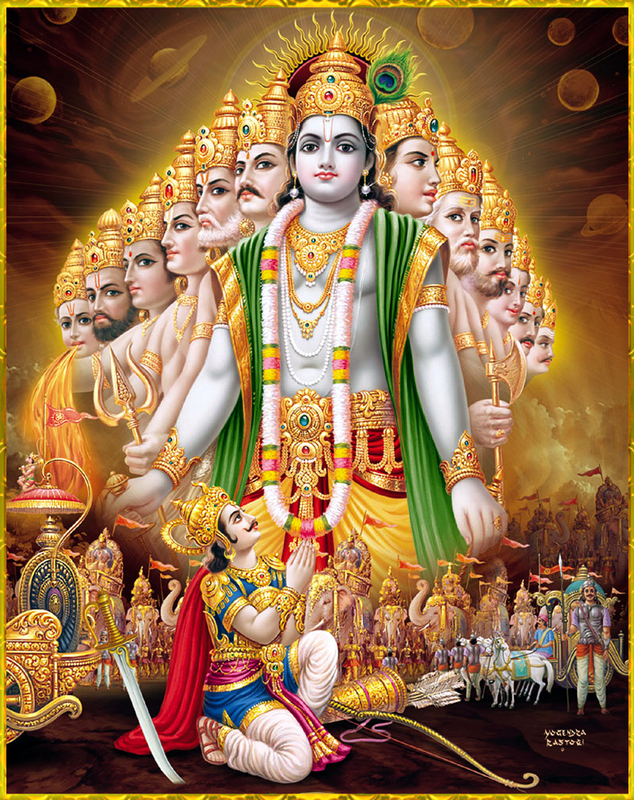 Throughout the rest of the Gita, Krishna speaks of the Dharma in terms of “HIS” own teaching of spiritual knowledge and not directly in response to Arjuna’s argument about dharma as ordinary religious and moral practices. Krishna is literally saying AAG laga do aisey dharma ko, replace it with what I am saying! Clearly Krishna reserves the phrase “this dharma” for discussions of pure devotion to the Lord. In Chapter Nine “this dharma” refers to the supreme process, which Lord Krishna calls “very easy to perform” (susukham kartum): the devotional service of the Lord, believe in Krishna consciousness —the only process praised in the chapter. In marked contrast, Lord Krishna criticizes the ordinary Vedic dharma by which one seeks residence in Indra’s heaven. Krishna starkly contrasts the ordinary dharma of the Vedas with “this dharma,” which is pure devotional service to Krishna. Krishna is creating a brand new paradigm of Dharma itself, one that is vibrant, progressive, one that is proactive and reactive, one that does not sit still and accept the destiny but that Dharma that creates that new destiny.